I don’t know if Exalted with the Timbermaw Hold is of any great advantage unless you have Tailoring, Leatherworking, Blacksmithing, Enchanting or Alchemy and could use their patterns, or if you are attempting The Diplomat Achievement. I found myself at that point near Revered when it seemed like a good idea to finish it up to Exalted so off I went to grind it out. The Timbermaw Hold Reputation Strategy is the fastest and most efficient way to get to Exalted. I wish I would have read this earlier as I had already turned in the cloth and totem quests so I had to make up the points by grinding. 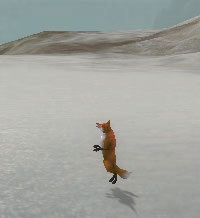 The best advice I can give is simply follow the guide – pick up the quests as indicated, grind mobs until they no longer give reputation points, save all those feathers and beads, then turn them in until you reach Exalted. You didn’t kill them to get through the tunnel, did you? If you did, you will have to repair that reputation! Feathers can be dropped on the Felwood side, beads on the Winterspring side – it doesn’t matter if you pick just one or use both. I found feathers dropped far more frequently than beads so I wouldn’t bother with beads unless you are doing other quests in Winterspring. Furbolg camps are found in the North and South areas of Felwood. The South camp is not as spread out as the North camp so it can go a lot faster just running up and down the hill than traveling around the lake in the North. In the South camp, I could easily run down the middle pulling mobs from both sides (about 5 or 6 at a time) and let the pet take care of them while pulling the next set. Park yourself at the top of the hill where Overlord Ror spawns – he’s worth 60 rep points. Be careful – he has a “Fear” spell that might send you running! 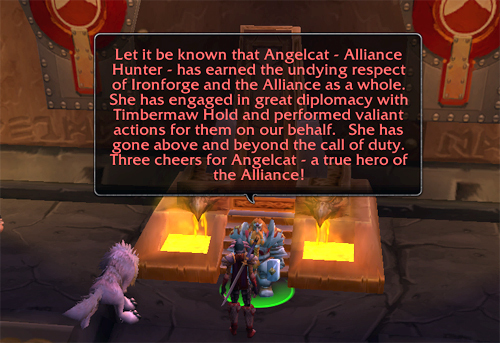 Also watch for the rare spawn Ragepaw – he’s worth 100 rep points. I only saw him twice and the second time someone beat me to him. Any of the camps can be very busy with other players grinding for rep or doing quests. If someone is there for a quest, take a break and let them get what they need – nothing more frustrating than trying to complete a quest when everyone is killing your target! Everything is on a fast respawn, so be nice – don’t be a hog! 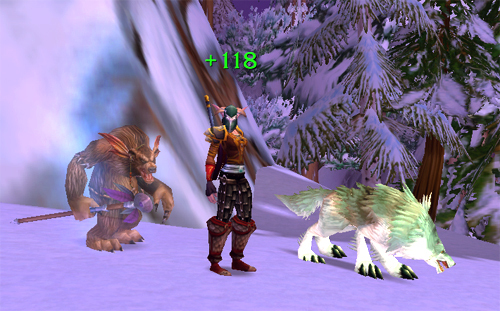 If it gets too busy, head over to Winterspring for the beads until things quiet down. It tends to be a lot less populated over there probably because the mobs are a higher level and the bead drop is so low. Wait until mobs no longer give you reputation points before turning in feathers and beads – I can’t emphasize this enough! Don’t forget Humans get a reputation bonus so try to calculate this out to save some time. Have plenty of bag space available – feathers and beads will stack up to 250, but you’ll need extra room for some nice drops. A lot of green items dropped including the Schematic: Parachute Cloak – quite a welcome surprise! It took me about 2 1/2 hours to get approximately 180 feathers. There is a furbolg stationed just outside the South camp area to accept feathers. He will only take 5 at a time – too bad there isn’t a way to turn in 100 at a time! I just kept turning them in until I reached Exalted with a few left over. After reaching Exalted, you must travel back to the tunnel and get the Root of All Evil Quest from Gorn One Eye. This quest involves lighting a provided torch in a cave on the Winterspring side, defeating the demon (Xandivious) and collecting the essence. Depending on your level, take a group or buddy with you – Xandivious has about 12,000 health points so be prepared! Xandivious doesn’t come from the inside of the cave, he appears at the outside, so don’t get caught staring into the cave while he attacks from behind. When he is defeated, the essence is obtained from his “Demon Bag”, not his body so be sure to check around him for the “sparkling” case. Return to Gorn One Eye to complete the quest and receive your Defender of the Timbermaw Trinket! Don’t forget to pick up the Brokering of Peace quest from Gorn One Eye and take it to King Bronzebeard in Ironforge so he can announce your heroic achievement! Now you can enjoy your Defender of the Timbermaw Trinket! 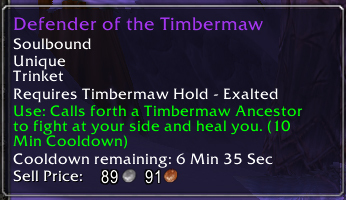 As an added bonus, Exalted with the Timbermaw Hold will also give you the They Love Me in That Tunnel Achievement. Next up – the Sporelings! Follow for Boring WoW Stuff! © A. Lucas and Wolfgangcat, 2009. Unauthorized use and/or duplication of this material without express and written permission from this blog’s author and/or owner is strictly prohibited. Excerpts and links may be used, provided that full and clear credit is given to A. Lucas and Wolfgangcat with appropriate and specific direction to the original content.